In the investigation of the Los Zetas alleged Laredo ranch takeover, one issue became very clear. Our border with Mexico is a VERY dangerous place. Yet some democrat congressional representatives, including Pete Stark (D-CA) and Sheila Jackson Lee (TX CD 18), dismiss or even mock the concerns of their constituents over this serious matter. 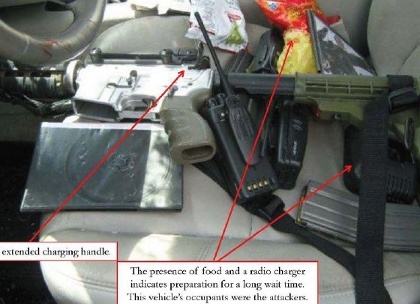 As far back as May of 2009, the FBI was warning law enforcement officials along the border of the threat of Los Zetas. The Houston Chronicle reported Los Zetas had acquired a ranch in a secluded area to conduct operations on the US side of the border. The last installment of this series of reports featured a report from Texas DPS about the 3 hour gun battle that took place in July in Nuevo Laredo. Download and view the Nuevo Laredo Cartel Battle aftermath, July 16, 2010. Since then stories of the violence in Mexico continue. NPR's story, Mexico's Drug War Hits Historic Border Cantina, discusses the impact of recent violence in Juarez, Mexico and the over 28,000 drug war related deaths in the past 4 years. Yet recently, Congressman Pete Stark (D-CA) went as far as making jokes about the border being secure and actually demeaning his constituents who would dare to question him on this topic as illustrated in this video. His arrogance and insolence is stunning. Is this the kind of representative government we want? Is this what our founders and generations of Veterans have fought for? I think not… What do you think? Texas State Representative, Allen Fletcher said, "As the only retired peace officer in the Texas Legislature, I am gravely concerned about the security of the Texas/Mexico Border." He continued, "We have already seen violent crime in Houston related to the drug cartels and human smuggling. Unless we take action now to secure the border, it is just a matter of time before more violence spills across the border and innocent Americans are killed." Texas Republican candidate for the Texas 18th Congressional District, John Faulk said, "This is an excellent example of what is wrong with the current Congress and its Democrat leadership!" Faulk continued, "A representative should never lose sight of the ideal that he or she works for the people. Our southern border is a very dangerous place and border security must be taken seriously!" When called for comment, Houston Congresswoman Sheila Jackson Lee's office stated her position as acknowledging "that much work has already been done to secure the border, but much more must be done to satisfy the American public on this issue". I was invited to call back next week to speak with her Deputy Chief of Staff for further clarification. The Congresswoman was out of the country and not directly available for comment. Her record reflects something different however. According to "On the Issues", the Congresswoman voted against building a fence, where appropriate as a tool to secure the border. She voted no on a bill to prevent the disclosure of US Minuteman Project operations plans to the Mexican Government putting American lives at risk. And US Border Control, a non-profit, tax exempt citizen’s lobby, rated her at 0% indicating an open border stance. Our investigation has shown there is no verifiable truth to the rumors of the Laredo Ranch take over. But we do know there is much to be concerned about. Warlike violence occurring just across the border will spill over if government doesn't take one of its fundamental roles (national security) seriously. Telling the people the border is secure, when there is evidence every day to the contrary, is just, well… Dishonest. Is that what you want in government? If not, get involved! Register to vote! Pick a candidate who represents your values. If you live in a district where your representative does vote your values, find a candidate in another district where your help CAN make a difference! The November 2nd election is coming quickly! What are YOU willing to do?